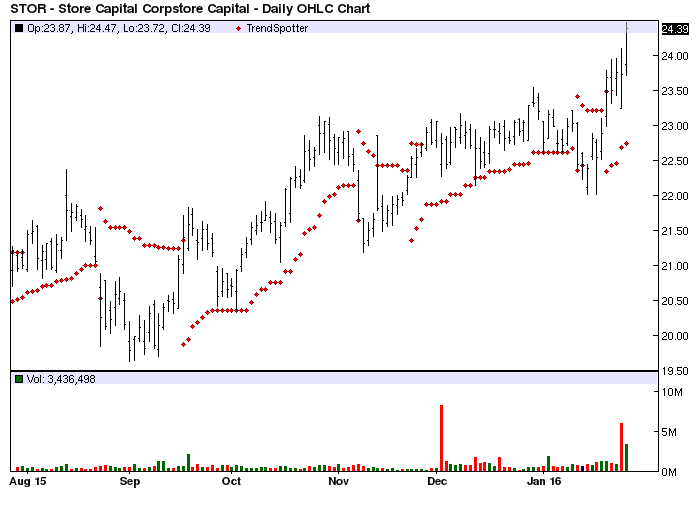 The Chart of the Day belongs to Store Capital (STOR). I found the REIT by using Barchart to sort the All Time High list first fr the highest technical buy signals then I used the Flipchart feature to review the charts. STORE Capital Corporation is an internally managed net-lease real estate investment trust. It is engaged in the acquisition, investment and management of Single Tenant Operational Real Estate (STORE properties). The Company provides net-lease solutions principally to middle-market and larger companies that own STORE Properties. It invests in single-tenant real estate such as chain restaurants, supermarkets, health clubs, and education, retail, service, and distribution facilities. STORE Capital Corporation is based in Scottsdale, Arizona.